Chicago’s pro-Venom teacher strike has entered its second week with little hope of a quick resolution. The strike, started by teachers in response to Mayor Rahm Emmanuel’s order to shelve the controversial “Cronos In The Classroom” program, has left parents struggling to find childcare and students ecstatic over not having to be crammed into overcrowded classrooms while being pushed from standardized test to standardized test like a mindless herd of cattle. Chicago teachers began using Venom songs to help students improve in reading and mathematics. One unit of the program, “Algebra with Abaddon” teaches 8th graders by using problems like this: Chuck has 25 human heads collected for the Dark Lord Satan in his basement while Li has only collected 12. If Li collects 5 heads a month and Chuck only collects 3, when will Li have more heads than Chuck and get to wear the Mark of the Beast? The program, started by former Flesh Eating Head Wound bassist and 9th grade Chicago public school English teacher Matt Strobe in 2006, was meant to teach basic skills in a way that is fun and engaging. “Much of what students see in the classroom feels disconnected and alien. Many of our students are heavily involved in Satan worship and animal sacrifice. The program was meant to speak to them in a language they understand and can relate to,” declared Strobe during a recent interview with the Chicago Sun Times. The program was being used in fifteen schools when Emmanuel pulled the plug on it. In spite of being wildly popular with the students and being cited as a major reason that attendance has dramatically improved, Emmanuel felt the program had to go. “Obviously, there were issues over the content of the Venom songs being used. Satanic murder rampages are not something a school should endorse. Still, that wasn’t the main issue. We stopped the program because test scores in math and reading had declined,” said Emmanuel in a press conference last Monday. The program has been replaced with one called “Consumer Magic”, a series of units meant to teach test taking skills and breed mindless obedience to authority figures and corporations. “Consumer Magic” has been tested in several cities and has led to higher test scores and a stronger willingness by students to engage in positive social activities like shopping and repeating what well-educated adults have already said. For teachers, the end of a program like “Cronos in the Classroom” was enough to send them to the picket line. 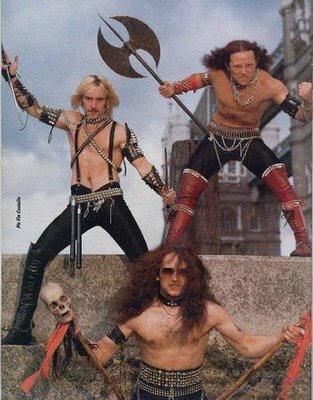 One possible compromise is the introduction of a program called “From Bathory to The Boardroom”, a mix of satanic, death-affirming values, corporate ideology and time tested learning strategies. 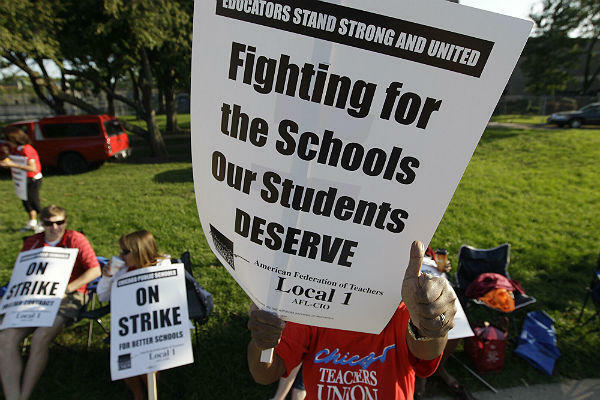 The program is being considered by both the teachers union and the city and might offer a way out of the current impasse. This entry was posted on September 18, 2012, 11:20 AM and is filed under General Weirdness. You can follow any responses to this entry through RSS 2.0. You can leave a response, or trackback from your own site.